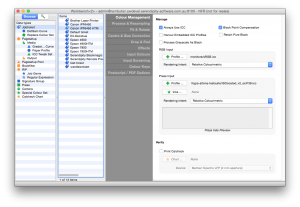 Jobticket is a new database item added to the Workbench database in Serendipity Blackmagic / Megarip / Veripress version 6.0. Existing users upgrading to v6.0 should also refer to the Pagesetup changes in version 6.0 knowledge base article. Jobtickets consist of configurable options used to manipulate incoming jobs for the required output. Available options are organised into categories displayed as tabs on the left-hand side of the details pane for each Jobticket in the Workbench database. 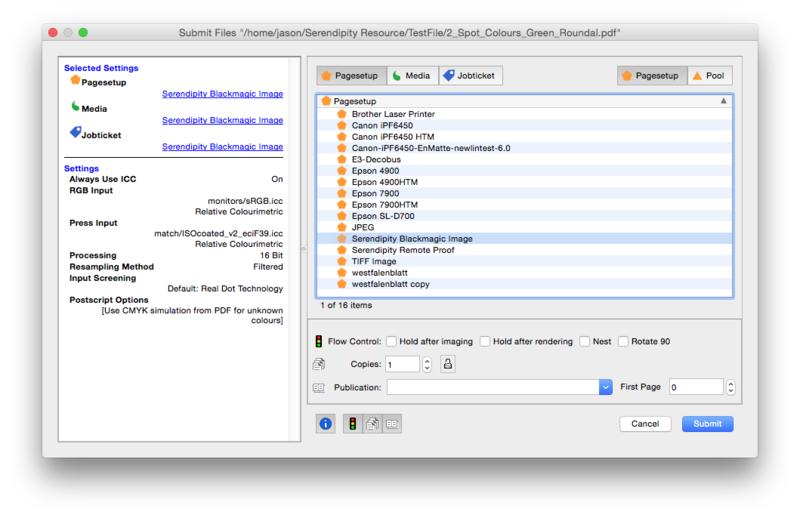 The Serendipity Blackmagic / Megarip / Veripress Product Manuals include more detailed information on Jobticket options and settings. A Jobticket can be linked to a specific Pagesetup as a default, changed or created on-the-fly via the updated Submit window. 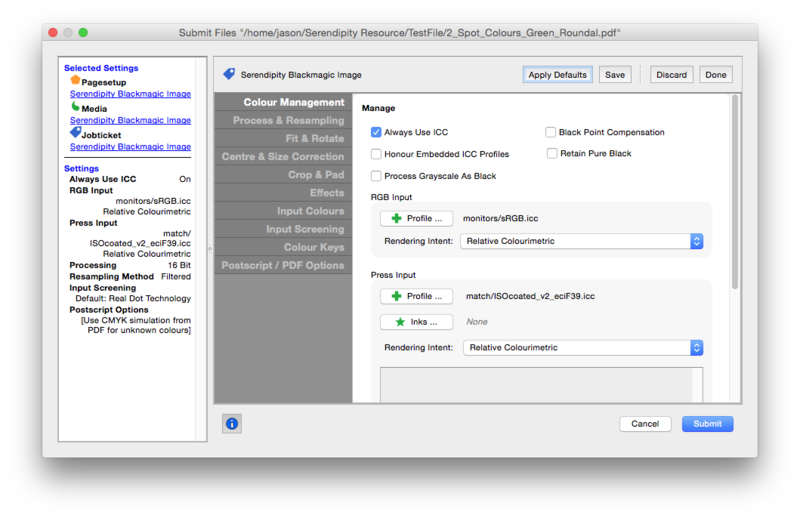 The version 6.0 Submit window is comprised of a preview panel to the left; a main panel for selecting a Pagesetup (or Pagesetup Pool), Media, and Jobticket combination; and submission control panel. 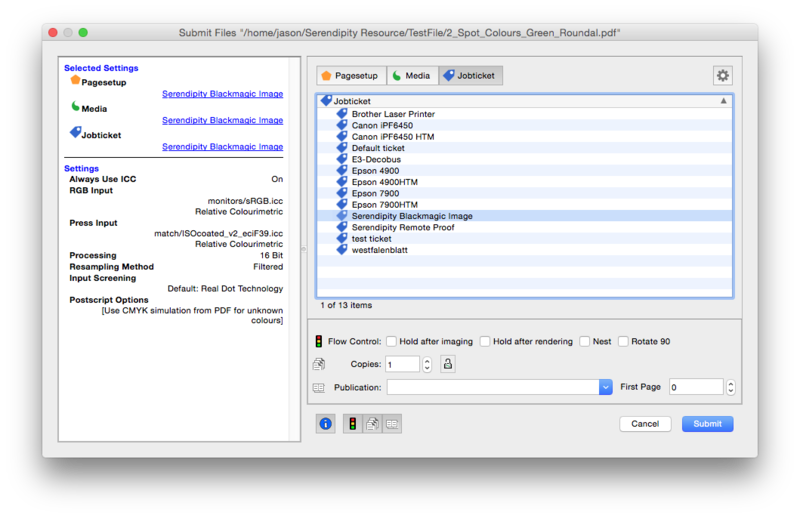 The Preview Panel displays the currently selected Pagesetup, Media and Jobticket. A summary appears when a Jobticket is attached, displaying any custom settings to be used for processing the job. The Jobticket panel has an Edit button (Cog icon) at the top right, allowing the currently selected Jobticket to be changed on-the-fly for the jobs being submitted. Buttons offer the option to Apply Defaults (see Server Settings below) to the Jobticket, Save the current changes to the Jobticket, or Discard any changes made. A Done button confirms the current changes for Submission, without permanently saving the changes to the Jobticket. Jobs can be Submitted at any time using the Submit button with any current changes applied to the job. If a Pagesetup has a Media and a Jobticket assign to it, the user can simply select the Pagesetup to Submit a job to the default settings. Default Jobticket – assign a system default Jobticket. This Jobticket is used when submitting to a Pagesetup without an assigned Jobticket. This is the Jobticket assigned when the ‘Apply Defaults’ option is chosen in the Submit window Jobticket editor. Immutable jobtickets – when this option is enabled, jobs in the Queuemanager retain the Jobticket options they had when they were first submitted, even if the job’s ticket is subsequently changed. If the job is reprinted or Rendered again it will do so with the original jobticket options. This entry was posted in Blackmagic, Megarip, Printing, Serendipity Client, Veripress, Workbench and tagged Version 6.0+. Bookmark the permalink.